13 Time Management Tips For Busy Moms - Tips and tools that add value to your world. To give you balance and to make you feel good. You can use these in life, business or both. I’m sure you’ve heard over and over how a To Do List can help you get through your day. What happens though, if you keep making one and things aren’t getting crossed off? I don’t know about you but that has happened to me more than once. Luckily, I found that there is a way to master my To Do list, get things done and feel good about crossing those tasks off. With that said, today is an EXCITING day! 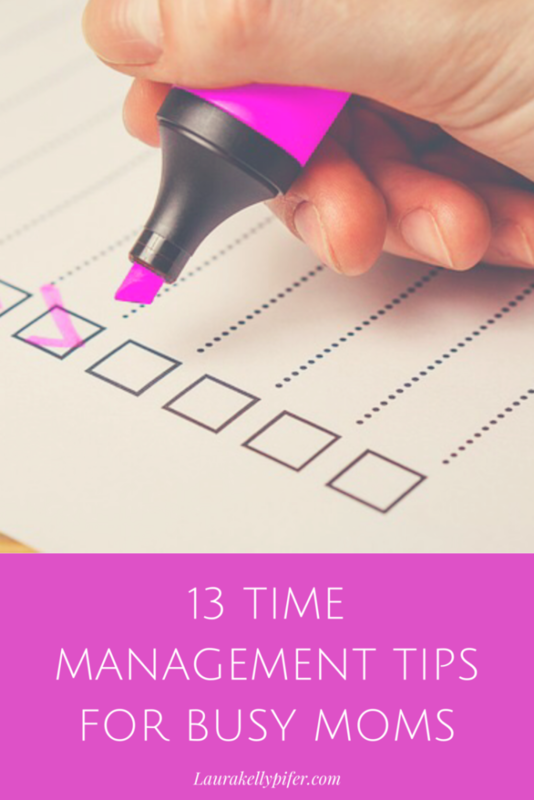 I’m going to share with you 13 helpful tips on Time Management for Busy Moms. Create a daily plan. It’s easier to stay on track when you have a plan. Before you begin the day, jot everything down. Some moms find that doing this the night before is even better. Note all the tasks that need to be completed, the appointments that are scheduled, and anything else that needs accomplished. You’ll then know what your day looks like so you can plan accordingly. Delegate. What things are you good at? What things are you not so good at? Are there items that can be outsourced or given to someone else to complete? This can take a load off you so that you can stick to the important things that you’re working on. Sometimes, you can even involve the kids with helping. You know yourself better than anyone else. Do what feels right. Know your deadlines. When making your to do list, write down your task or project due dates on your paper calendar or schedule them in your online calendar. If you don’t have one than assign one. Prioritize. What needs completed first, then second and so on. Prioritize the tasks that need completed for the day and work in that order. Batch similar tasks together. I try to group similar tasks together. For example, I’ll do all of my Administrative tasks (email, phone calls, etc.) in the same time block. This helps keep me focused. Assign a time limit to each task. If you have multiple projects that you are working on, assign a time limit to each one so that you are accomplishing more throughout the day. An example: project X needs to be completed by 10 am, project Y by 3 pm and project Z by 5 pm. Have a clock visibly placed before you. Sometimes we are so engrossed in our work that we lose track of time. Place a clock in front of you so that you’re aware of what time it is and how much time has elapsed. Set reminders. Most calendars will allow you to set reminders as you schedule appointments. When I have an appointment, I’ll set the reminder so that it alerts me prior to the appointment with a minimum of 15 minutes. This is great because it tells me that I need to finish what I’m working on and get ready for my appointment. I can even have texts sent to my phone to let me know that my appointment in up and coming. Focus. It’s easy to get side tracked by distractions. Focus on one task at a time and block the things that you know will distract you. For me, I know that instant messaging or texting can become a distraction so I log in a few times per day to check in and then log back out so that I can get back to the actual task on hand. I can also put my phone on “Do Not Disturb” for group chats which has been wonderful! Track your time spent. Most smartphones come with a timer. If you know that you only have 30 minutes to work on a task, set your timer and hit start. It will count down in the background while you’re doing your work. When the time is up, the timer will go off. Another way to count back time is the timer on your stove top. I use this often when working. Use a calendar. Having a calendar with your appointments scheduled is one of the most important pieces to the time management puzzle, especially if you’re a busy mom. You can input everyone’s activities here so that you have it all in one place. Personally, I use a free calendar, google calendar, to keep track of things. I can sync it with my work calendar, the kid’s calendars and access everything else like gmail, my google drive, etc. via an app on my phone. It’s also desktop friendly which helps. There are many other free calendars out there that you can do a search for to see if it functions like you would like. Another one I really like that is free also is cozi.com. And you can always go with an oldie but goodie…the paper calendar that gets printed up each and every year. Use an organizer or planner. An organizer helps you to be on top of everything in your life. Without mine, I honestly don’t know which direction I’d be headed. Just kidding but in all seriousness, an organizer/planner can be your central tool to organize information, to-do lists, projects, and other miscellaneous items. I even have all of my bills in mine and it helps me see what’s going on all the time. I keep my business expenses and mileage noted as well and it’s great having this all in one place come tax time. A planner is extremely helpful if you’re a visual person like me. If you would rather go the online route, there are varieties of time management software programs online or for purchase. Do you research to see what works best for you. Learn to say “No”. Okay, momma. Here’s one of the best pieces of advice that I was given and I’m going to share it with you. You don’t have to accept every invitation you get and it’s gonna be alright to say no. You have permission to do so. If it’s something that will cause you stress, cause you discomfort, etc. than just say no. You don’t owe anyone an explanation. There you go…13 Time Management tips that any bust mom can begin to use immediately. Start with one and then add to it. You’ll soon be a master of your time. Do you have a Time Management tip that wasn’t shared? Post it in our Community so that others can learn too.